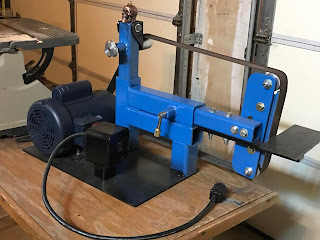 Since I made the BG-272 Belt Grinder in 2013, there have been many knifemakers that have built their own variations. 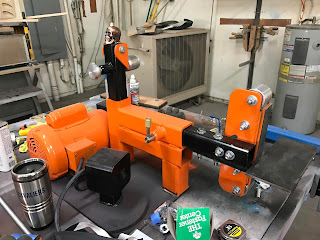 As makers of things, we often use whatever parts are available and this means every build is something personal and unique. 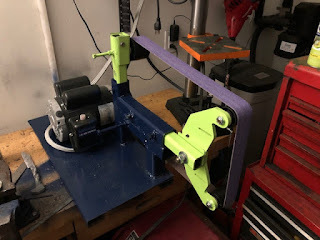 Note that a lot of builds are using wheels and platens from Oregon Blade Maker . You may want to check them out on eBay. This is a gallery of some of the amazing builds that have have been submitted to me since 2013.
it tilts 90° so it goes vertical or horizontal. Nice setup! 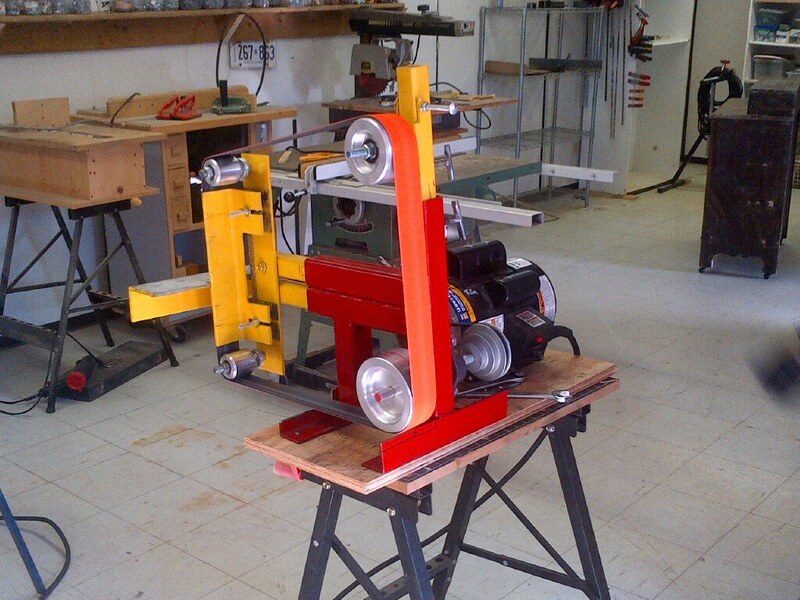 Kenneth DeRosier's 2"x72" with stepped sheaves on a 2 hp 4 pole 1800 RPM motor for variable speed. That giant work rest is sweet! 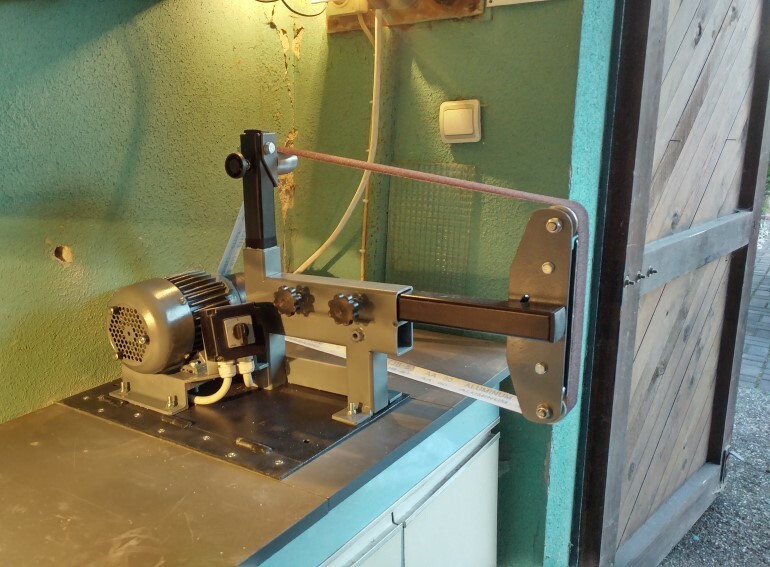 From the Netherlands, Lars Langveld's version with a 1.5 horsepower TEFC motor driven by a VFD. 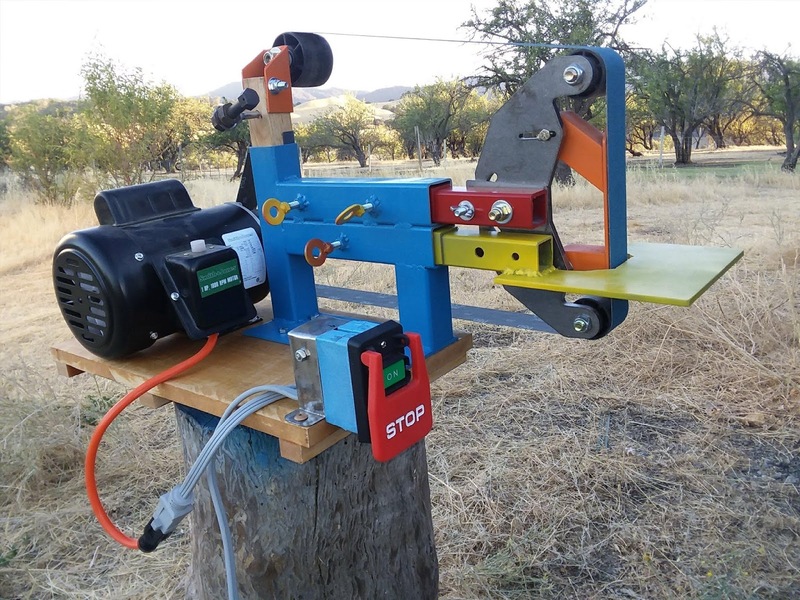 Michael Sargent's 2"x72" powered by a 2 horsepower Hitachi motor and TECO VFD. 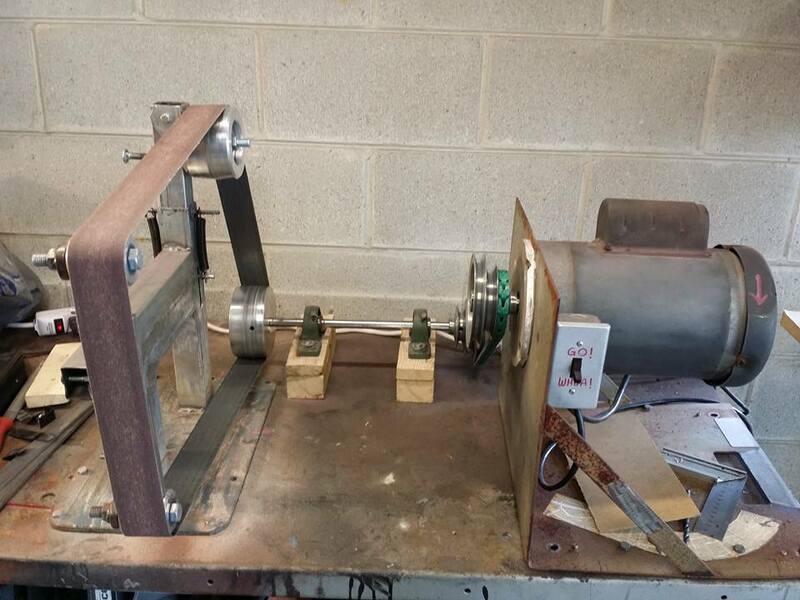 Rob Chapman's version with stepped sheaves and right-hand side motor. 3600 RPM featuring a 5-4-3 pulley and 5" drive wheel. Love the power switch! Take a look at Rob Chapman's spring setup. The is actually pulling the pillar upwards! Springs are from a futon mattress frame. Luke Gibson's build. Direct drive in red and black and features a riding lawn mower seat spring for the tensioning. 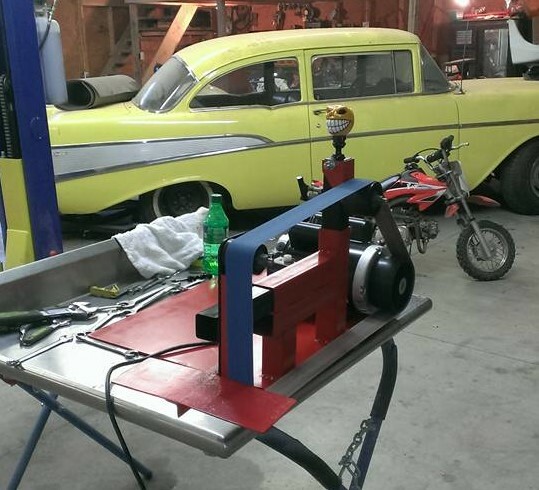 Seth Mullet's build with a 1.5 horsepower 3600 RPM air compressor motor on stepped sheave. The motor is mounted underneath. 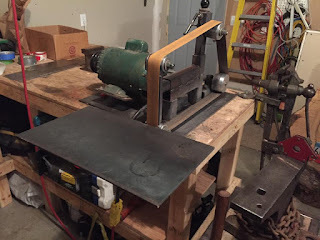 The flat platen I believe is from Oregon Blade Maker. Here's Todd's build using the stepped sheave setup for multiple speeds. This is Lin's build with a 1-1/2 hp direct drive two pole motor running full load at 3450 rpm. The drive wheel is 3-1/2", the tracking wheel is 2-1/2" and the platen wheels are 2". Lin did all his own machine work. Very cool build! Here's a couple of grinders built by Steve Gann. One is for himself in blue, and the other is for his school metal shop where he's a teacher. The motors are 1.5 horsepower 2 pole TEFC. Great looking builds Steve! Thanks for sending the photos. 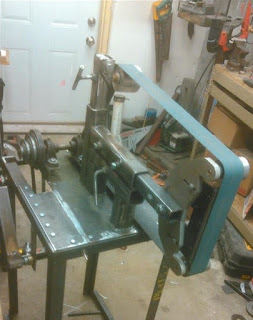 This is Glenn's nicely refined grinder. In South Africa belt grinders are not so common, so he set out to build his own. Very well done with a TEFC motor and Variable Frequency Drive. Hope to see lots knives coming off the bench Glenn. Anthony sent this picture of his 2" x 72". An amazing build. Being from the Yukon (northern Canada) he had to work extra hard to get all the parts in, but the results impressive. 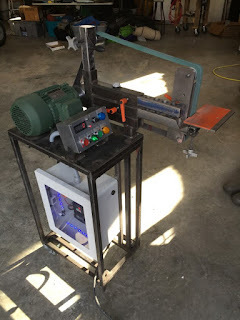 2 Hp 3600 RPM 3 phase motor 240 V, Hitachi Inverter, 5” Drive wheel and adjustable work rest. Also a remote start/stop, Fwd/Rev, speed control potentiometer and tachometer... plus extremely cool blue LEDs in the drive enclosure! 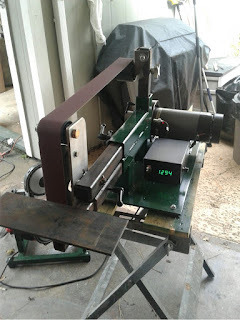 Rob from Houston made this "lefty" 2x72 with a 3 horsepower treadmill motor with added tachometer. Looking good in green. Alan sent me this photo in of his grinder. Featuring a 1 horsepower TEFC four pole motor, OBM D plate and custom made platen. Living in a farming community he went with Ford blue, Massey Ferguson red, Kubota orange and John Deere yellow. This one comes from Victor, painted blue and green (a Seahawks fan). 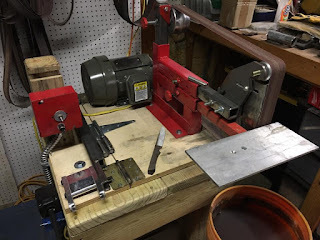 The motor is a 3 horsepower 3600 RPM and the platen and wheels are from Oregon Blade Maker. Grind on brother! 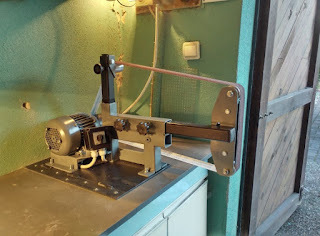 Dusan from Serbia sent me this photo of his build featuring a hinged base and 1.1 kW single phase motor. Note how he put some spacer bolts on the back of the motor so it rests above the bench when in the horizontal position and still allows airflow over the motor. 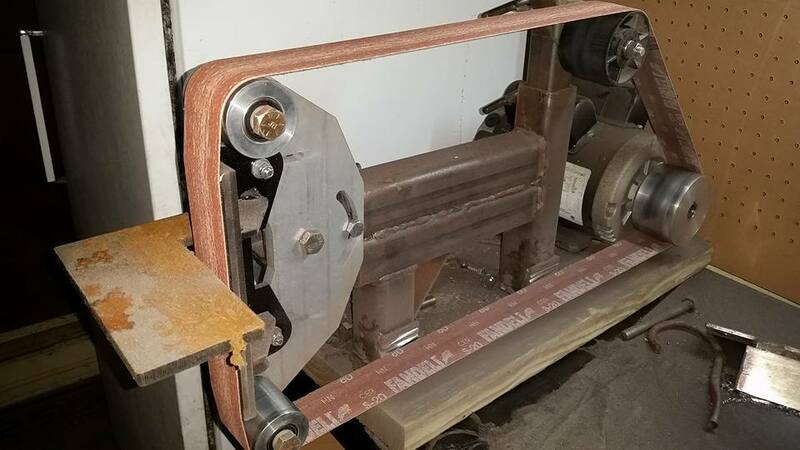 UPDATE: Marinus at Oregon Blade Maker is offering some high performance, yet light-weight and durable grinder wheels for a low cost 2x72" DIY build. These wheels are engineered, glass-filled nylon (durable composite plastic) with 1616RS bearings. The wheels in this set are two 2-1/4"x 2" and one larger diameter crowned 2-1/4" x 3" which is designed to assist in belt tracking. The installed wheel's bearings are 1616RS which will mount with any 1/2" bolt. Plan for three 1/2" NC x 3" Grade 8 bolts and suitable nylon lock nuts. 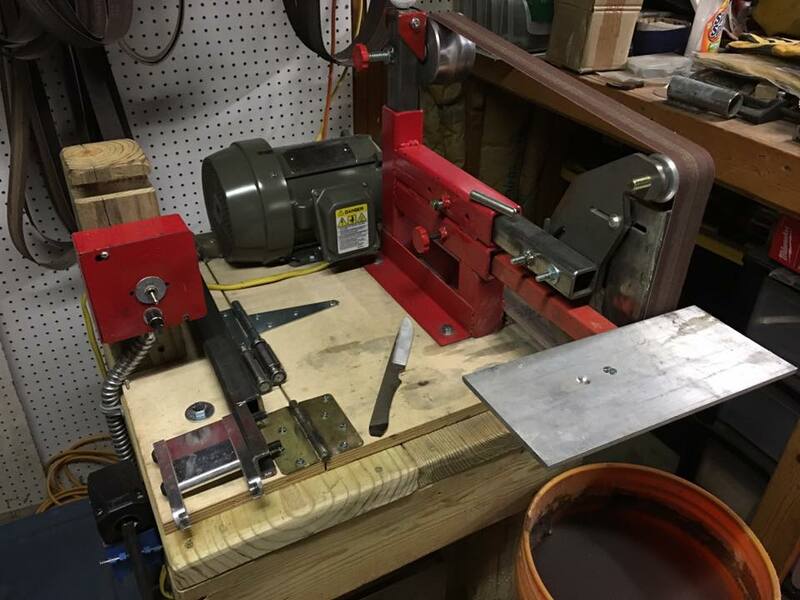 Thank you for submitting your grinder builds. Hopefully there are many more to come. Thanks so much for posting all these!!! 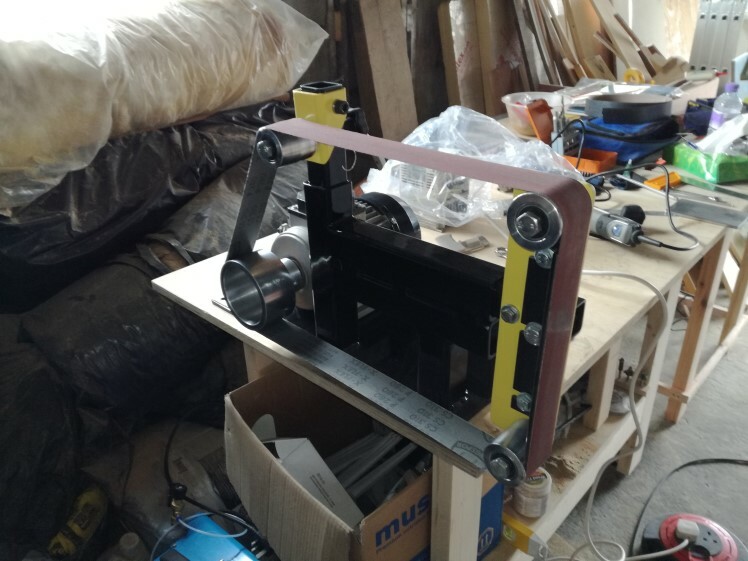 Yes, having the tracking wheel crowned is important as the belt which is flat tries to position itself to the center of the wheel as that is the largest diameter. This improves belt stability. I'm a hug fan and have been lurking your site for some time now, however, I recently found a post on Craigslist for a belt grinder I am very interested in. I took the time to compare/contrast it to the builds you have posted on your site, however, I would really like a professional opinion on the pictures before I go in to talk to the seller. Any input would be greatly appreciate, thanks for your time! It looks pretty good. The motor is a decent horsepower. The build quality looks good from what I can see in the photos. 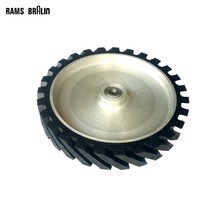 Give it a spin. See how the belt tracks. 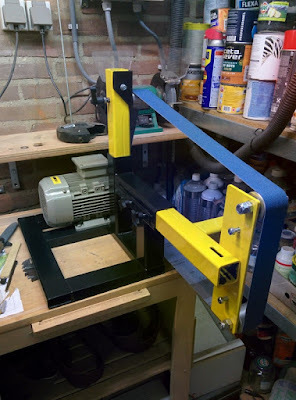 Push some steel into it and see how it performs. 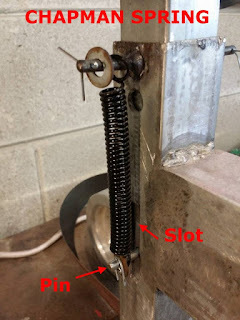 If you look at the first picture shown above you can see how Derek did his with a hinge setup. 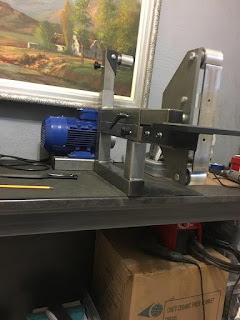 I just built my grinder. having trouble finding the right spring for the pillar. can someone help me? Any compression spring that's between 30 and 40 lbs that fits inside the vertical receiver will work. Ideal length is about 3". They can be bought from McMaster-Carr with the a part number 9657K445. This part number is for a package of 6. I have used storm door springs as well. Hope this helps.